This section is a review of the Really Right Stuff TVC-34L tripod. What is the right height of tripod? Taller tripod is the RRS 34L extended to maximum height 5'10. The shorter one is the Feisol 3471 also extended to its maximum height a flat 5 feet . Checking the difference in my garden with a 600mm f4. My back is hurting just looking at the picture and thinking of the countless hours I have been hunched over in that position. For shooting in the forest I would say get a tripod that is your height or an inch or two taller at full extension. Birds are usually up in the trees and they rarely come closer once they see you. When shooting on an even slope on a hillside or mountain the tripod height becomes even shorter because you have to shorten a leg or two to make it level.You end up bending even more when on a slope. 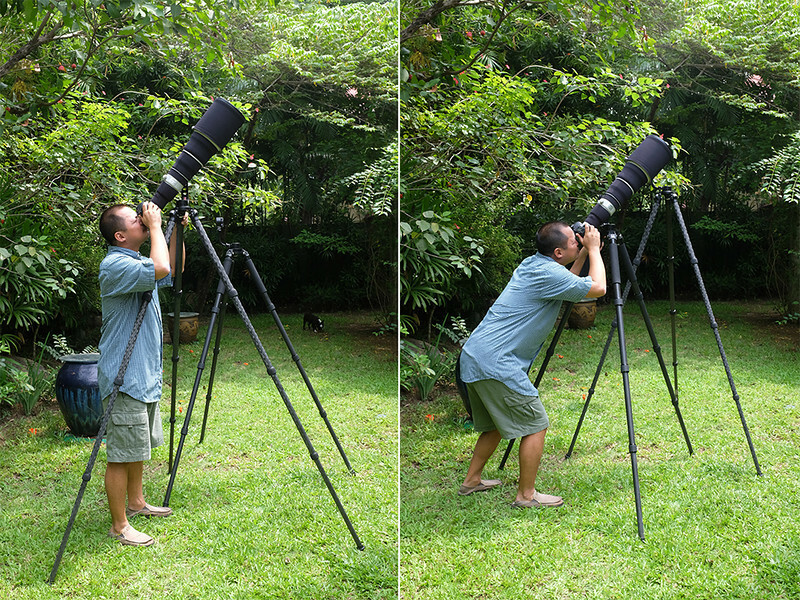 Strangely most tripods for super telephoto lenses are around 5 feet tall. I guess they think if you need something taller you should put a center column. I don't like center columns in tripods. Its just another possible source of shake. If you don't shoot it the forest much and you prefer the wetlands or waders then you don't need a tall tripod. If your back is nice and supple maybe you don't need a taller tripod either. You can use one of the many models that max out at 5 feet. Personally my back gets stiff after looking up the whole day. I think the right fit is very important. I think it is worth the time to find the tripod the fits you best.